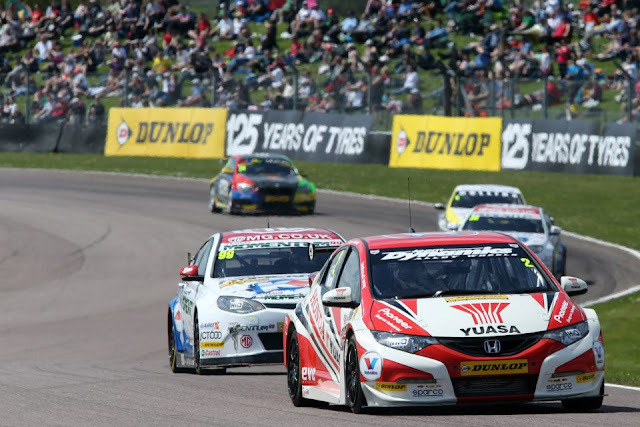 Thruxton is my local circuit so when the opportunity arose to attend the British Touring Car Championship race day with Honda Yuasa Racing arose I jumped at the chance. Thruxton is an old airfield which lies to the south of Salisbury Plain in Hampshire so is one of those big, open, windy circuits. It's also the fastest race track in the UK (not counting the Rockingham oval which isn't used much any more) where the BTCC touring cars lap at an average 113mph. It's basically a huge clockwise loop around the perimeter of the airfield with a couple of technical sections and a nasty chicane with huge kerbs, right at the end of the lap. After a bacon sandwich and cup of tea in the Honda Yuasa motorhome we set off to watch the Ginetta Junior Championship and Porsche Carrera Cup to scope out the best spot to view the races. 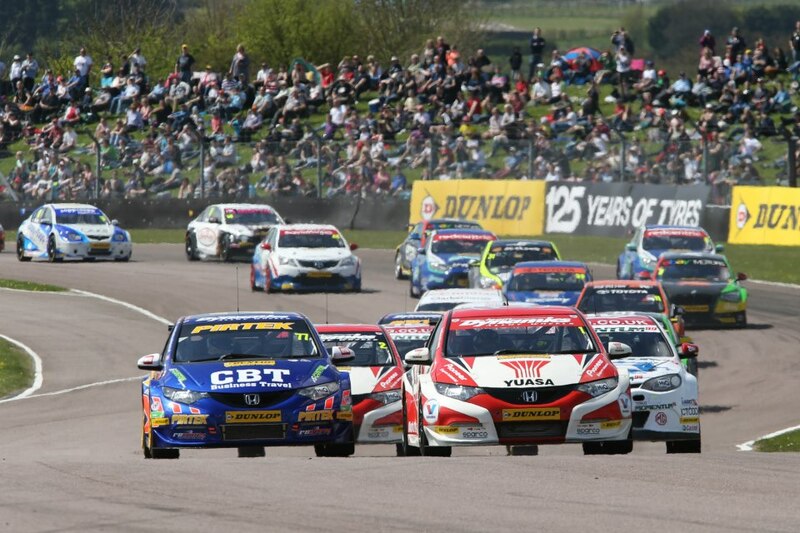 Watching any race at Thruxton from the infield isn't much good as you hardly see any of the track. It's best to go and camp out on one of the grass banks which stretch from the last corner chicane right round to the second and third corner chicane. BTCC race one started at mid-day. We stood on the bank directly opposite the pits. The Porsche 911s might be 5mph per lap faster but they cannot match the sheer excitement and spectacle of a 27 car grid of touring cars. Most of them are pretty ordinary hatchbacks and saloons and most are front wheel drive but the only similarity between the touring cars and their road going versions are the shape. Everything else is stripped out and replaced with lightweight, toughened parts, and the driver sits low and as near to the centre of the car as possible. And they sound much better than any 2 litre road car. Their 300bhp, 2 litre turbocharged engines snap, crackle and growl and as they line up to start the race the sound of 27 BTCC cars at full revs dumping their clutches and firing away from the line makes the hairs on the back of your neck stand up. The race brought plenty of action. Honda's Gordon Sheddon was tipped off track by Jason Plato in the MG on the first lap, hit the barrier and limped back to the pits. Thereafter Andrew Jordan in a privateer Honda lead the field, followed by Matt Neal in the Honda Yuasa Civic. Jason Plato was third with Tom Onslow-Cole in a VW Passat CC behind him. Until, that is, the final lap when Jordan's front left tyre exploded and Matt Neal inherited the lead. Plato and Onslow-Cole were second and third and Andrew Jordan eventually came across the line in eleventh. We headed back to the Honda motorhome for a slap-up lunch then spent the next hour in the paddock. It was particularly fascinating watching the Honda mechanics rebuilding the front of Gordon Sheddon's Civic. The engine is encased in it's own rollcage built from steel tubes. The suspension is inside this cage and linked to the font wheels via hinged links. BTCC is a pretty rough and tumble race series so by having the suspension inboard it avoids damaging the components when rubbing wheels with competitors, and the barriers. Sure enough the car was rebuilt, with a new front bumper and splitter, in just under 2 hours. We watched the next BTCC race from the bank on the outside of the first corner. 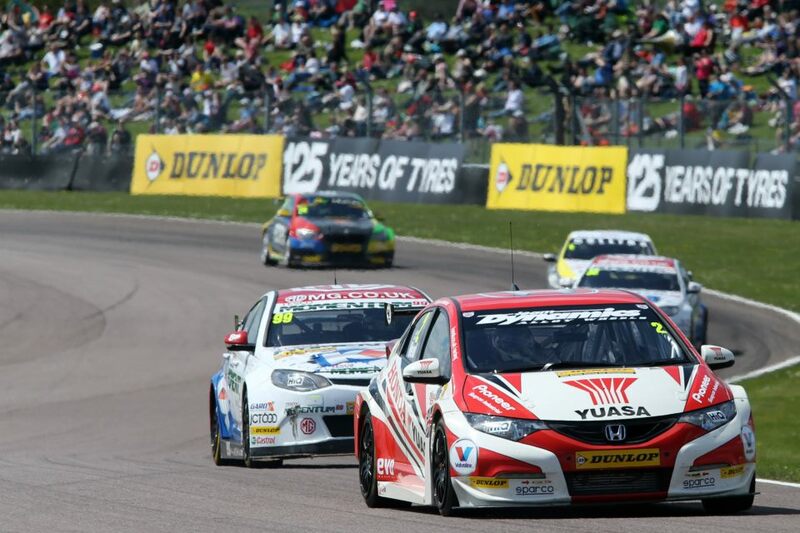 It was another great race and another victory for Matt Neal in the Honda Civic. Gordon Sheddon, who had started last by dint of his result in the previous race, stormed through the field to finish an incredible third. It was stunning to watch. After the race we headed back to Honda for afternoon tea and a pub quiz. Speedmonkey didn't win. We didn't even get in the top 3! Matt Neal came in for a Q&A. He was buzzing after his double victory, and the fact the first race win was his 50th win in the BTCC. Matt proved to be a great bloke. Very down to earth and obviously a genuine, ego free race driver. He gave us the thumbs up as he left the motorhome. Then came our highlight of the weekend - a grid walk. Just ahead of race three we headed out to the grid and watched from the side of the track as the grid girls lined up, then the cars came through and parked up in their grid slots. We then headed over to Gordon Sheddon's car for some photo-ops and to soak up the atmosphere of a race grid just before the start. It was a pretty sensational experience. You have to watch your back at all times for mechanics, cars, TV crews and sponsors checking out where their money was spent. We ran back through the paddock, under the pedestrian tunnel and up to the grass bank opposite the pits just as the cars were revving up for race 3. The crowd were pretty excited, and vocal. the last race of the day is often the one with the most action because the teams have a few weeks to fix the cars, rather than a couple of hours. It was another great race. 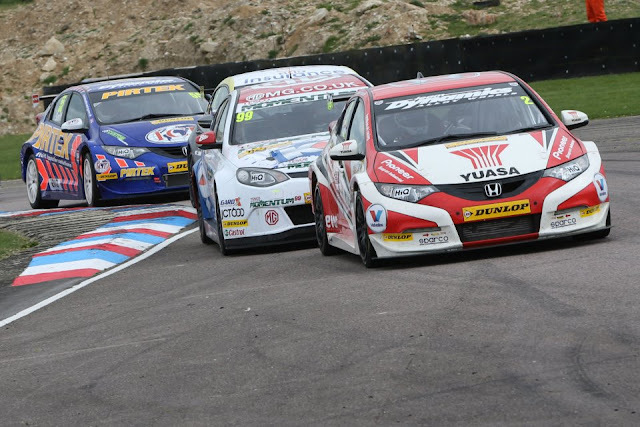 Honda Yuasa Racing took a 1-2 with Gordon Sheddon winning this time around and Matt Neal in second. Jason Plato had been running at the top of the field but he suffered a late race front left puncture which gave Andrew Jordan a third place in his privateer Honda Civic. I watch most BTCC races on the TV. I hadn't attended a race in years (my last was Oulton Park, 2001 I think). Unlike Formula 1, which is often better to watch on the TV than at the race track, BTCC is a better experience at the track itself. The crowd, the sight and sound of the cars, the smell from the burger vans all make for a pretty magic experience - if you're a petrolhead. If, like me, you haven't been to a BTCC race for some time then I urge you to go. You'll enjoy it. I did. Most of the photos are by me. The on-track photos are courtesy Honda Yuasa Racing.